The Jam would like to give you a chance to win four ticket vouchers to see Blue Man Group at Briar Street Theatre and a $50 Lettuce Entertain You gift card! Blue Man Group will rock your world and blow your mind. Experience a spectacular journey bursting with music, laughter, and surprises! Blue Man Group is best known for its award-winning theatrical productions which critics have described as "ground-breaking," "hilarious," "visually stunning" and "musically powerful." These performances feature three enigmatic bald and blue characters who take the audience through a multi-sensory experience that combines theatre, percussive music, art, science and vaudeville into a form of entertainment that is like nothing else. Now through Friday, December 7, 2018, at 11:59 PM CDT, fill out the submission form to enter for your chance to win four ticket vouchers to see Blue Man Group at Briar Street Theatre and a $50 Lettuce Entertain You gift card. Three (3) winners will be randomly selected using a computer software winner selection tool from all eligible online entries. Please check this page for winners. NO PURCHASE NECESSARY. Void where prohibited. By entering, each entrant accepts and agrees to be bound by these Official Rules. Failure to comply with these rules may result in disqualification. SPONSOR. This Sweepstakes is sponsored by ‘WCIU, The U,’ 26 N. Halsted, Chicago, Illinois 60661 (the "Sponsor"), which is solely responsible for the conduct of this Sweepstakes. ENTRY. 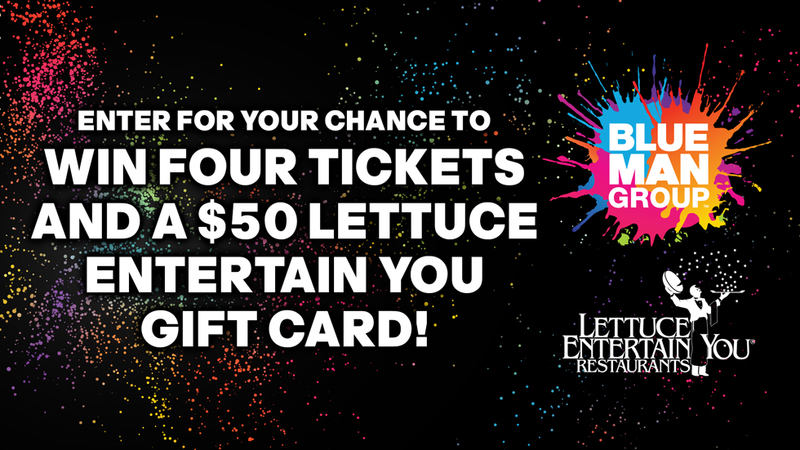 A purchase is not required to enter to win four (4) ticket vouchers (the “Prize”) to see Blue Man Group at Briar Street Theater running through March 31, 2019 and a $50 Lettuce Entertain You gift card. ‘The Jam & Blue Man Group’ Sweepstakes begins Monday, December 3, 2018 at 12:00 AM CDT and ends Friday, December 7, 2018 at 11:59 PM CDT unless extended by ‘WCIU, The U.’ To enter the Sweepstakes, viewers must do so at WCIU.com and complete an online form to register. Only one (1) entry per person, per email address, per 24 hour period will be accepted (12AM-11:59PM). Three (3) winners will be randomly selected using a computer software winner selection tool from all eligible online entries. Sponsor is not responsible for lost, late, illegible, misdirected or mutilated entries, due to technical/network failures, human error, or any other error or malfunction. Entry materials that have been tampered with or altered are void. Entrants agree not to upload, post or transmit any materials which contain any computer viruses, Easter eggs, worms, Trojan Horses or other harmful component or programming routines that are intended to damage, detrimentally interfere with, surreptitiously intercept or expropriate any system, data or personal information. Any attempt to deliberately damage any website or undermine the operation of the Sweepstakes is a violation of criminal and civil laws, and the Sponsor reserves the rights to seek damages from any person who makes such attempt(s). Any questions regarding the number of entries submitted by an individual or authorized account holder of an e-mail address shall be determined by ‘WCIU, The U’ in its sole discretion, and ‘WCIU, The U’ reserves the right to disqualify any entries by persons determined to be tampering with or abusing any aspect of the Sweepstakes. ELIGIBILITY. ‘The Jam & Blue Man Group’ Sweepstakes is open to all legal residents of Illinois and Indiana who live in the Chicagoland television viewing area (as defined by A.C. Nielsen) and are 18 years of age or older. Employees of ‘WCIU, The U’, Blue Man Group, and their advertising agencies, consultants, franchisees, suppliers, (collectively, “Sweepstakes Parties”) are not eligible to enter or win, nor are such employees’ family members. In addition, individuals who share a common household with an employee of a Sweepstakes Party or who are in any kind of domestic relationship or partnership with an employee of a Sweepstakes Party (e.g., boyfriends, girlfriends, fiancé, roommates) are not eligible to enter or win this Sweepstakes. Sponsor shall be the sole judge of what constitutes a domestic relationship or partnership in the event of a dispute. There can only be one (1) winner per household per sweepstakes. For all prizes, there is a limit of one (1) winner per household every thirty (30) days. For prizes valued at $500 or more, there is a limit of one (1) winner per household every ninety (90) days. PRIZES. Three (3) winners will be awarded with four (4) ticket vouchers to see Blue Man Group at Briar Street Theater running through March 31, 2019 and a $50 Lettuce Entertain You gift card, valued at $326. Once notified, the winners will have three (3) business days to claim their Prize. If a winner fails to claim their Prize, it will result in the forfeiture of the Prize and a new drawing may be held from the remaining eligible entries at the discretion of ‘WCIU, The U.’ Prize Winner must possess a valid picture ID to claim their Prize. PRIZE RESTRICTIONS & CONDITIONS. These prizes are non-transferable and will be delivered no later than five (5) business days at the expense of Weigel Broadcasting Co. to the winner via UPS Ground with signature required. Prizes are subject to terms and conditions of the Prize provider and Sweepstakes Parties. The current blackout dates are 12/19/18 – 1/6/19 and 2/14/19 – 2/17/19. There will be no substitute or cash redemption awarded to the Sweepstakes winner. All income and other taxes are the responsibility of the winner. By entering, the winner is consenting to the use of their name, likeness, and/or biographical information for advertising and promotional purposes without additional. DISCLAIMER OF LIABILITY. Winner is responsible for income and other taxes on the Prize. Winner will be required to sign and return an Affidavit of Eligibility, Release of Liability, Publicity Release and Letter of Indemnification within three (3) business days of notification of being a winner. Failure to comply with the rules and conditions of the Sweepstakes may result in a forfeiture of Prize. ‘WCIU, The U’ and Sweepstakes Parties explicitly disclaim any and all warranties of any kind, including but not limited to, implied warranties of merchantability, fitness for a particular purpose, and non-infringement. The Sponsor and/or Sweepstakes Parties shall not be liable or responsible for those guarantees or warranties made or offered by advertisers, partners, manufacturers or suppliers, including those related to the Prize. Under no circumstances shall the Sponsor and/or Sweepstakes Parties be held responsible or liable for use of the information and/or products supplied and/or made available through the promotion or for errors or anomalies resulting in the unintended or erroneous participation, award of any prize or other benefits under the jurisdiction of these sweepstakes rules. By participating in this Sweepstakes, all participants and prize winner agrees that Blue Man Group, their partnerships, subsidiaries and affiliates and each of such entities’ respective officers, directors, agents and employees are not responsible or liable for any injury, loss, illness, litigation or damage that may occur from participation in the Sweepstakes or acceptance, possession, use or misuse of prize. In the event that any dispute arises regarding the meaning or interpretation of these official rules, participants agree that the dispute shall be resolved by applying the laws of Illinois and that it shall be resolved by and within the state or federal courts of that state. The Sponsor and Sweepstakes Parties offer no assurances, warranties, or guarantees that the promotion in any media, including but not limited to on air, text/mobile phones and websites, will be uninterrupted or error-free and do not promise the accuracy or reliability of any information obtained through this sweepstakes. The Sponsor and Sweepstakes Parties will not be liable, and are not responsible, for damages of any sort connected to participation in or inability/failure to participate in the sweepstakes, whether the damages are direct, indirect, special, incidental, or consequential. MISCELLANEOUS. The decisions made by ‘WCIU, The U,’ concerning any and all matters with respect to this promotion shall be final. In the event of a computer, telephone failure, or any other circumstances beyond the control of ‘WCIU, The U,’ where it becomes impracticable to award one or more prizes, ‘WCIU, The U,’ may, in its sole and absolute discretion, determine not to award any such Prize. This Sweepstakes is void where prohibited, penalized or otherwise restricted by law. A copy of these official Sweepstakes rules are available at the ‘WCIU, The U’ offices located at 26 N. Halsted, Chicago, IL or by writing to ‘WCIU, The U,’ ‘The Jam & Blue Man Group’ – December ‘18,’ 26 N. Halsted, Chicago, IL 60661. ‘18,’ 26 N. Halsted, Chicago, IL 60661. Viewers can also find the official Sweepstakes rules at www.WCIU.com. If you wish to receive the name of Sweepstakes Prize Winner, you must send a self-addressed, stamped envelope to ‘The Jam & Blue Man Group’ – December ‘18’ 26 N. Halsted, Chicago, IL 60661. ‘WCIU, The U’ must receive any request for the Winners’ names no later than February 30, 2019.